My 22 year old treadmill died this week. The dreadmill, the device of torture, the hamster wheel, the necessary evil for a runner living in the midwest--whatever you like to call it-- finally called it quits. On a recent icy day when conditions were too hazardous to run outdoors, I took to my old, reliable treadmill to complete my run. I couldn't get it to start, so I tripped the circuit breaker. The power came on and I started to run. After only a couple of minutes, the treadmill came to an abrupt stop. I again tripped the circuit breaker and resumed running, but again, the power went out. I could not get it to start again. Our relationship was complicated. I hated the treadmill, but I needed it. My treadmill was always there for me. Until this one last time. This death was a long time coming. For the past couple of years, my treadmill was increasingly unreliable. Most of the time, my runs went smoothly, but other times, the treadmill would speed up and slow down at will. I couldn't rely on the calibration for my miles, so instead, I ran by time. Thankfully, I didn't need to use the treadmill often, opting to run outside as often as I could, and that probably prolonged its life. My treadmill sits in front of a window in the ground level of our house, in a room that's kind of a junk room. Shoes and coats collect on top of the dog crate and an old chair that my husband refuses to discard. I've tried to make this room my workout room and my race medals adorn the wall next to the treadmill. There are also some running photos from memorable races, which are preferable to the view of my neighbors' brick wall. I received my treadmill as a gift from my mother-in-law, who was not a runner, after my oldest son was born. My post-partum anxiety was off the charts and running was the drug I needed to keep me calm. 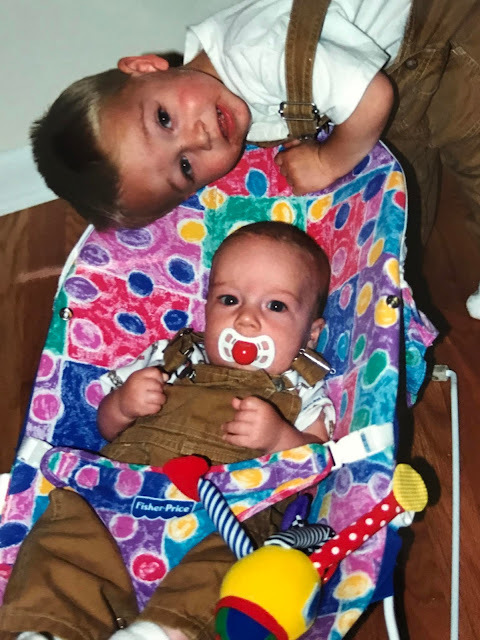 When I couldn't run outside, which was pretty often in those days, I'd put my infant son in his car carrier and set him next to me while I ran. Sometimes he'd cry and I'd cry too, begging him to let me finish the mile I was in. When he was older, he'd play next to me while he entertained his baby brother who was in the infant seat. I eventually had to put a gate around the treadmill when I ran so they wouldn't try to climb on with me! These little monkeys made indoor running a challenge! I didn't run long or far in those days--but the sweating and pounding on the belt was enough to keep me happy. "Ain't nobody happy if mama ain't happy..."
When the boys were in grade school, we had a hamster, Stuart Little. He was a smelly little white rodent that we should have named Houdini. During those years, I was working second shift. When I would get home at midnight, Stuart Little was rarely in his cage. Most of the time I'd find him sitting in the family room, eating crumbs. We'd stare each other down. I'd shudder, knowing I had to pick him up. He'd look at me mockingly as if he knew I didn't want to touch him. Back into the cage he'd go, with another layer of duct tape wrapped tightly around the lid to try and contain him. How he got out, I'll never know. But he always did. After one such escape, he was missing for about a week. We figured he was a goner but kept the cage out in case he reappeared. A few days after his disappearance I got on my treadmill to run. I inserted the key and slid the dial up to the speed I wanted. As the belt started to move, I heard a scratching noise inside the motor. I stopped the belt and the scratching continued. My husband took the cover off the motor, and there was Stuart Little, covered with black grease. Next to him was a pile of dog food. He must have made trips back and forth to the dog's bowl to amass his stash. Back to the cage he went, sealed back in with more duct tape. My dogs were never fans of the treadmill. I don't know if it was the noise of my feet on the belt or the fact that they were baffled by me running and not going anywhere. I've had 3 cocker spaniels in the time frame that I had this machine. Most of the time, the dogs came in the room while I was on the treadmill to see what I was doing and then left. Cocoa, my current cocker and probably the smartest one of the bunch, spends her time trying to figure out the treadmill. She stares at the belt while I run, sometimes dropping a ball on it and watching it shoot off the back. Cocoa loves to play fetch but hasn't quite figured out that she could be dropping balls on the treadmill and chasing them while I'm running. As I start shopping for my treadmill's replacement, I'm amazed at the features available on the new machines. My treadmill was an old ProForm with no bells and no whistles. I turned it on and I ran. I've always listened to music when I run on the treadmill to help with the monotony. Before the era of the iPod, I had a boombox that blared music at me from cassette tapes and then eventually CDs. With the advent of the iPod, treadmill running became much more tolerable as I could vary the music on my playlists and fast forward over songs that weren't doing it for me. 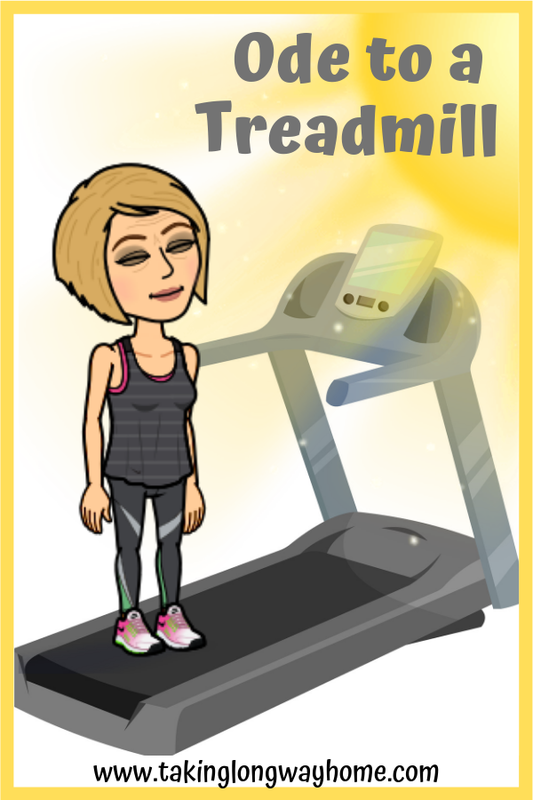 I was never a treadmill TV watcher--I read once somewhere that a runner would get better results if they were focused on the run instead of the screen. I don't know if that's true, but it's stuck with me. Friend or foe, my old treadmill made life as a runner much easier. Having a treadmill was a luxury that allowed me to run when I couldn't get outside. Even though I have a lot of memories and many miles associated with the old treadmill, I'm not sad that it's time for a replacement. I'll probably stick to a basic machine, one that gets the job done. I'd love a fancy treadmill, a Peloton or a Woodway but as a runner who loves to run outdoors, I can't justify the expense. I'm pretty sure I'll love and hate the new machine as much as the old one. It will be there when I need it. After all, it is a treadmill. How old is your treadmill? Do you use it often? Love it or hate it? Fancy or basic? Any recommendations? 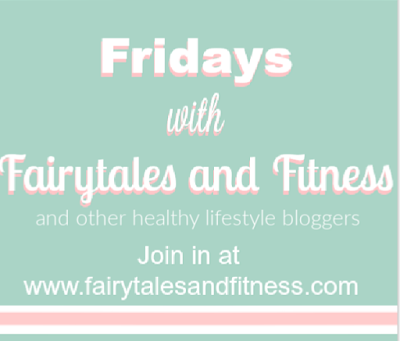 I'm linking up with Fridays with Fairytales and Fitness. I think mine is about 18 years. We actually got it when I lived in TX, before I ran — so I could walk when it was ungodly hot out. It was kind of fancy for its time but now would be basic. 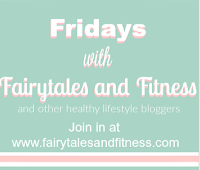 I have a story about critters & the treadmill in yesterday’s post. The Boys were actually fascinating with it & would jump on it while I was running. Both Chester & bandit would curl up on the chaise next to me while I’m running; Lola does it more often these days but she’s not super fond of the noise. My boy dogs both had overpowering needs to be with me. I'm heading over to your blog to read your post! My treadmill is 12 years old it was a Christmas present from my dad I asked for it after I got hurt running outside.I love that I can work out in the comfort and safety of my home. My treadmill is a Proform too it has programs but I just adjust it manually and it works just fine. We service it ourselves and so far so good. I see people giving away treadmills for free on Craigslist or nextdoor.com all the time but I don't know that I would want a used one. Good luck in your search. I found a brand new ProForm that was rated a best buy by all kinds of sources. I ordered it from Amazon. Paid the same as I did for my 22 year old treadmill! I hope it lasts just as long. Aw, your treadmill served you well. OMG on that hamster - the stash of dog food!!! I got my treadmill after 9/11. Before that, my kids were OK with me going out for a run before they woke up, but after my son was scared I wouldn't make it back. I use hotel gym treadmills, but I can't remember the last time I used mine. Some winters, like last year, I don't run on it at all. This year looks to be a treadmill kind of winter! I love this story, especially the details about your kids and dogs! I use treadmills at the gym (to walk as I don't trust the way it changes my gait, and got an injury swapping from treadmill to outside one icy winter) and I just saw some really fancy ones with routes you could run "through" at the gym where I have my physio. They do appeal. Good luck choosing a new one! It's nice to have as a backup plan when it's too icy to get outside! 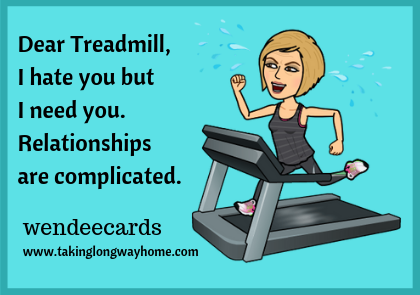 I understand completely your relationship with your treadmill. Not nearly as much fun as running outside, but when you need a running fix and Mother Nature is not cooperating, it's the best thing ya got! The stories of you running on the treadmill when your sons were little struck a nerve. I can remember literally handing my hubby the baby as he walked in the door so that I could get out for a run. Just 30 glorious minutes alone was the only thing I could think about by the end of the day! Those runs saved me many a breakdown when the boys were little. Our treadmill is just a baby at only 3 years old, but we've put a ton of miles on it. We have the Sole F63, and I wrote a post about it a few months ago and all of the things I considered when I was looking. If I had it all to do over again I would have gotten a home treadmill much sooner. Yes I would choose a run outside over a run on the tready any day, but that's just not realistic where I live and I've come to love the 'mill for letting me run when the weather won't. This is definitely the winter of the 'mill! Are you in Wisconsin? You know my thoughts on treadmill running LOL It was almost two years ago, on a rainy & icky day in March when my treadmill had a near death experience. It just shut down after the first mile, and I could not get it to come back to life. Amazingly, a few days later, on a whim, the hubby turned it on and it worked again...like nothing had ever happened. I runfess...as much as I detest that apparatus at times, I was a little sad when I thought it was gone for good. Mine has been trying to die for a while and we've kept it going. The way this winter is, I need something reliable. It's time. Yeah, you're lucky you live somewhere temperate! I don't have a treadmill. I hate them and I can't justify spending ANY money on one at all. We have a few in our community gym that I can use if I need to be on one, but like you, I would much rather be outside. I feel if I DID get one, it would have to be slightly more fancy than basic, maybe to trick me into enjoying using it more. But ultimately, I feel like it would just be there to hang towels. Can we talk about Stuart Little???? OMG that hamster!!!!! I thought your story was going to have a much sadder ending, but look at that little guy, surviving in your treadmill with dog food. I love it! And you know I always love Cocoa. What a cutie pie. I debated buying a new treadmill, but ultimately I need it. This winter has been challenging for runners--between the cold and the ice, running outside hasn't been easy or safe! Being without one this week made me nuts! It's truly a love/hate relationship! I loved your Stuart Little story! We had our share of rodents growing up but I can't imagine having one now. I haven't owned a treadmill in about 15 years. The strangest site to me is seeing people running on treadmills in various gyms in Waikiki, staring out the huge glass windows at the wonderful playground that I call my own. I can't imagine choosing the treadmill over outside running in Hawaii. Yeah the humidity is tough, but breathing the fresh air and listening to the waves is so much better. What the heck?? People are crazy! When I go to Hawaii (OK only twice in the last 10 years) I make sure to run as much as possible - it's so beautiful! Agreed! Who on earth would trade running outside in paradise for running on a treadmill in a gym? Dang, you certainly got your money's worth with that treadmill! Loved reading about the fun memories that came along with it, and I'm glad you aren't hesitating to get a new one. My husband balked when I told him I was buying a new TM. Seriously? If this one lasts half as long, I'll still have gotten my money's worth out of it. I don't have a treadmill but honestly ive thought of getting one. With weather as unpredictable as it is here (and sometimes I just want to sleep in and run whenever I want too) I think I could use one . Id say that's a great life span for a treadmill though! I think if I lived in Florida, I'd want a TM for the summer! Haha! I love that you named the gym TM! I never named mine. I had a NordicTrack treadmill (C 900 or something) that I loved. I got it in grad school as a graduation gift to myself (which required a LOT of penny pinching for several months, getting a good scholarship and assistantship, and then lucking up a big sale at Sears). It got me through early mornings in grad school and two polar vortex winters in Indiana, but then we had to sell it when we moved to Seattle because West Coast apartments are so much smaller. Now, I'm happy with the YMCA treadmills and track, but I would totally buy a Nordictrack one again if I get one. I looked at the Nordictrack TMs but they were a little more expensive and the ProForm I ultimately decided on was the highest rated "budget" TM. Sigh. End of an era. I feel like things I've had for a long time are a connection to the past. As much as the treadmill is not the preferred way to run, it is a necessity in our climate. All the best with shopping for the replacement! I was surprised at how many memories the treadmill holds! I am impressed that Stewart Little survived the treadmill situation! Lots of memories with your TM for sure! I have A Nordic track that I actually bought for my husband a few years back but it has become mine now. I love it! You're the second person to profess their love for the NordicTrack! I went with another ProForm. I love reading all about your memories with the treadmill. That picture of your boys is adorable!! I would rather run outside too. Took me a while to actually do it and “enjoy” running during the winter. However, this winter has been challenging and a treadmill is necessary. My gym has new treadmills but somehow they’re programmed for your weight to show up on the screen and then there are no number buttons to select or change the speed. I can go to another gym but I like the location. Oh nooooo! I'd be so sad if my treadmill broke. We'd need a new one pronto! I agree - there are so many features on the new ones. I don't want to even see because mine still works :) I'm not sure how old ours is, but it has something like 18,000 miles on it. We've replaced the deck and belt on it several times now. It's a solid machine (Precor)!